A few days ago I published “7 Point Structure” in response to an email question. But, over the time in writing and publishing I had returned to my email questioner to ask exactly what was meant – when she talked about 7 Plots, did she mean “7 Plot-points” or did she mean “7 plots as in Master-plots”? The response back was identical to the initial question – she meant 7 Plots. Which wasn’t ideally helpful. But such is writing – just about everything we talk about has one or two different names for the elements of a story, and sometimes we can’t be clear on what it is exactly that we may be looking for. So here are the 7 Master (or Basic or Universal) Plots. Of course, there are some who suggest there are only 2, 3, 6 or 10, 15 or 36 universal plots in the world. But then there’s Christopher Booker, who says there are seven basic plots. And of course, there are also references to seven types of conflict, which could be held up as plots. Firstly let me sidetrack to what one of the latest memes around is saying – that strictly speaking, there are only three master or universal story plots on earth. Being a total geek for all this stuff, I collected it. Actually, it’s six, but three of these are mirrors/reversals. These latest fall right in line with the seven qualified by Christopher Booker also, so if you want more detail, read Booker’s book (haha) or the resources linked to below. The latest meme comes out of the Computational Story Lab at the University of Vermont, and was released this July (2016 for those reading this later). 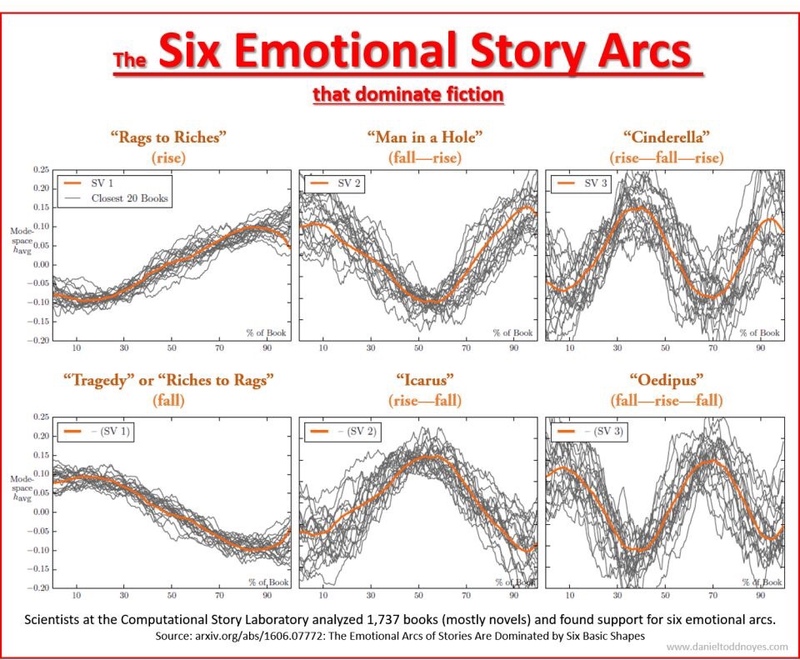 The researchers used computers to analyse over 1700 books for sentiment and map out these as emotional arcs. 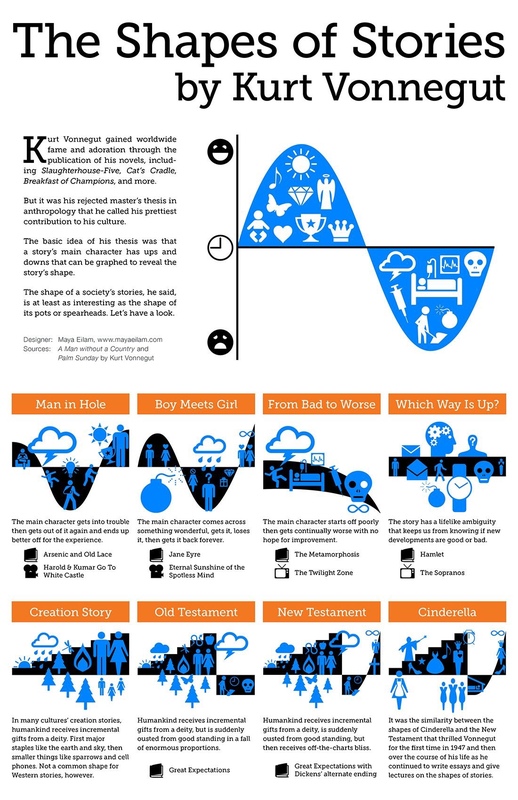 These story arcs or patterns are reminiscent of the famous story shape diagrams of Kurt Vonnegut, which were presented back in 1995 in a now famous video where he hand draws the story patterns. Read the media coverage of these findings here: MIT Technology Review, The Sun UK (credit for the images below) and a more detailed report from the Guardian. Note the patterns – rise-fall-rise, steady fall, fall-rise-fall. The names for each pattern may differ depending on what expert or group has named them, but the shapes remain the same. So basically three different ways to fall-rise or rise-fall. Back to Kurt Vonnegut, then. His initial theories of story shapes was rejected back in his earlier years, but now appears to be mathematically proven. Here are the story shapes of Vonnegut, curtesy of i09, the story shapes re-imagined by graphic designer Maya Eilam. Note: the video only shows some diagrams. In written format, Vonnegut added two more story shapes. Brainpickings has published these from his memoir. Example – Of course, these major conflicts must work in unison and with external and internal conflicts: Most man vs nature stories (in a huge storm, for instance) I’ve watched also include conflict between man vs man in trying to survive, and often man vs. [one] other, in that there is often a figure of authority the main character clashes with; and also man vs. self – the only internal conflict – all without even getting into the whole main through-line of there’s-a-world-ending-storm-coming-our-way. The major conflicts are something taught through our school systems, but also often cut down from the seven to either six or even four major conflict types (shown in the diagrams here), discarding the supernatural, technology, God/fate and other permutations, which can logically be represented in these four. Now Novel only describes six. This post at Bookosaurus describes five conflicts with examples from literature. If you have a basic idea of your conflict – or the theme you want to explore – you have a ready-made set of protagonist, the antagonistic force (the obstacle creating conflict) and some story events required to put the two together. Okay, got all that? Now we finally get to what is known as the Seven Basic or Master-plots. I think of them as Universal – early examples of each of these stories can be found in almost every culture or nation’s ancient tales. 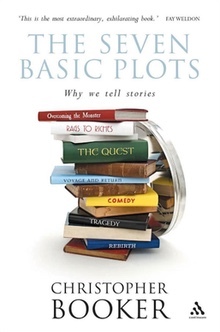 In 2004, Christopher Booker published The Seven Basic Plots: Why We Tell Stories. He’d worked on the theory for over 30 years. Note that even more recently (in my opinion) rebellion has become a genre almost of itself when you consider the many coming of age / bildungsroman stories in hot demand. The “One” doesn’t necessarily have to be an evil dictator, although many of our dystopian young adults like to have someone like that to rebel against. Eastern Writers – 23 page PDF (slides) – direct link to PDF. My Teacher Pages – 2 page PDF (summary) – direct link to PDF. You Write On forum – 2 page PDF (summary which also breaks plots out to stages) – direct link to PDF. How to Write a Book Now looks more in depth to the Booker plots here, and compares with other structures. 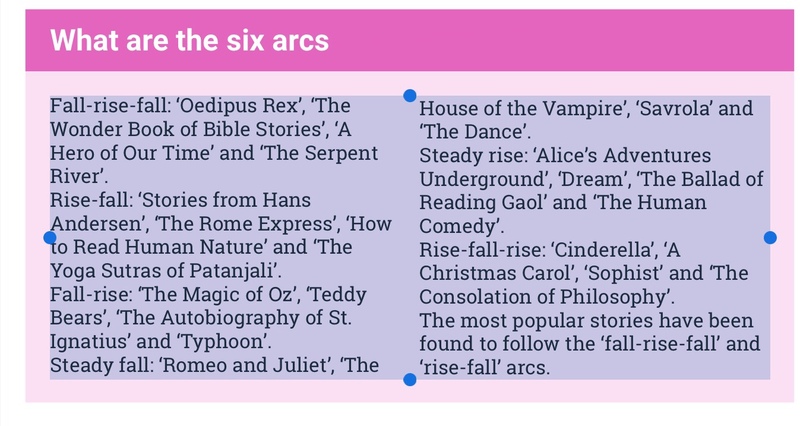 Story Bistro aligns the plots to other well-known story structures here. 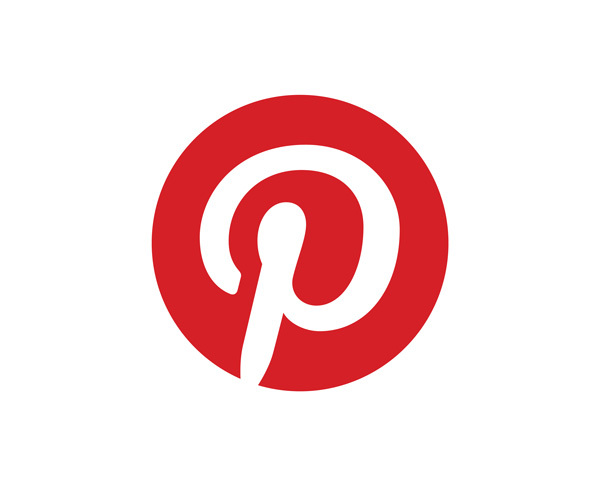 The same post by Téa Silvestre Godfrey is found at Business to Community pointing out that our storytelling elements are often tools used in marketing too. If you want to map the basic metaplots described by Booker (Anticipation, Dream, Frustration, Nightmare and Resolution) to other plot structures, below is a nice table from How to Write a Novel Now. The metaplot points fit within Michael Hague’s plot points, and across the Hero’s Journey.